Easter Bunnies — Dollar-Cheap to Super-Chic! Lately I have been on a “White-Ochre” chalk-painting spree…. I’ve recently painted my antique-tin-ceiling wall-art, my serving tray, my buffet, and even my giant spoon and my giant fork! So I thought — why not? It took two coats of chalk-paint to get the perfect look. The already-white surface covered super-easy, but the eyes and ears took a couple of super-thick coats. And just an FYI, when painting on this type of material, you have to wait for the paint to completely dry in between coats, or else it won’t stick properly. 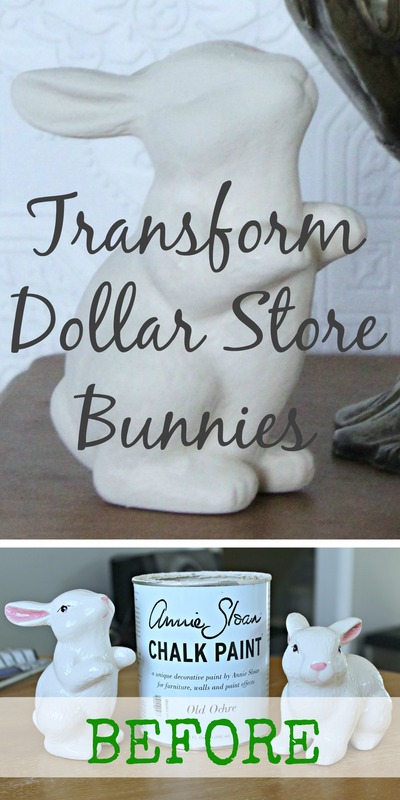 So basically, you can update your dollar store bunnies with whatever paint you have on hand, and you can use any color you like too! It’s such an easy, simple and cute way to customize your very own home decor! I personally think that these cute little bunnies turned out amazing! I couldn’t be more happy with them, and I can’t wait for you to see them incorporated with all of my other Easter decor…. but, we’ll save that for another day…. So make sure you stop back by The Project Pile to check it out! HERE ARE MORE DIY IDEAS TO TRY! 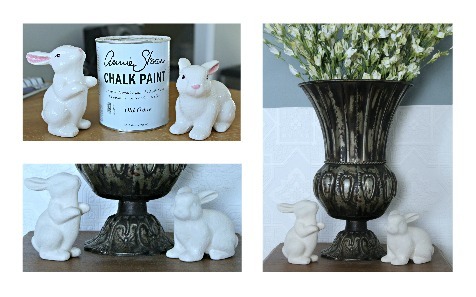 This entry was posted in DIY & DECOR, SEASONAL and tagged bunny, chalk paint, Decor, Dollar Store, Easter, home, rabbit, white-ochre by Sarah. Bookmark the permalink. You always have such cute little ideas to make any holiday decor come together! What dollar store did the bunnies come from? Such a cute idea!! I notice the pre-treated bunnies have what appears to be a ceramic glaze, or are shiny, anyway. Did you have to scuff up the surface by sanding first, or just coat them with the chalk paint? Just did this with a bunch of different coloured glass and ceramic bunnies, including one just like yours, and they came out beautifully! Thank you. Did you put a glaze on to get the shiny look?!? I love these and can’t wait to give them a try!